Dan and I found ourselves with a free weekend. What did we do? 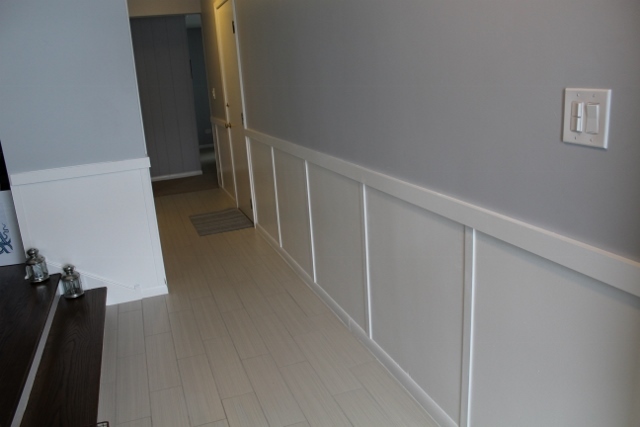 Put up board and batten in the hallway, of course. I’d been wanting to do this for a while, and now that it’s up, and wasn’t terribly difficult, I’m sure we’ll be doing this in our upstairs hallway soon. As I’ve shared in an earlier post, here’s what the hallway looked like before we got started. (Please excuse the bad photos – camera malfunction that I didn’t notice until it was too late!). As our main reference, we used the board and batten tutorial from Young House Love. 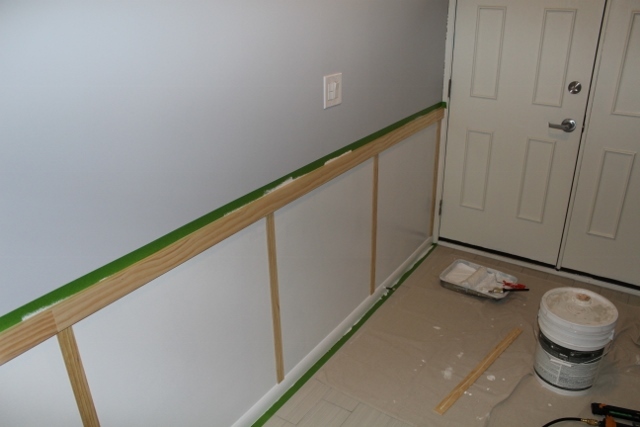 The main parts of the tutorial that we followed was painting the existing wall white instead of attaching boards to the wall (hence, no actual “board” being installed), and using thin lattice boards for the batten. In other aspects of the work, we did deviate from their directions quite a bit. 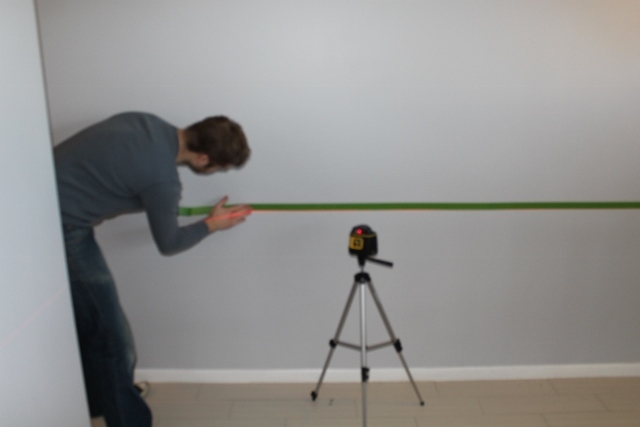 To start, we measured thirty-six inches from the floor and set our painter’s tape. We used a laser level, which was very, very handy if you can get your hands on one. The next steps were painting the wall and making the wood cuts. Unsurprisingly, I painted while Dan cut. We already had some paint leftover from painting our baseboards, so that cut out an additional expense. All we had was gloss paint, so we’ll see how we like it over time. We thought it would be good to be able to wipe off scuffs, since it’s easier to do so with gloss paint. 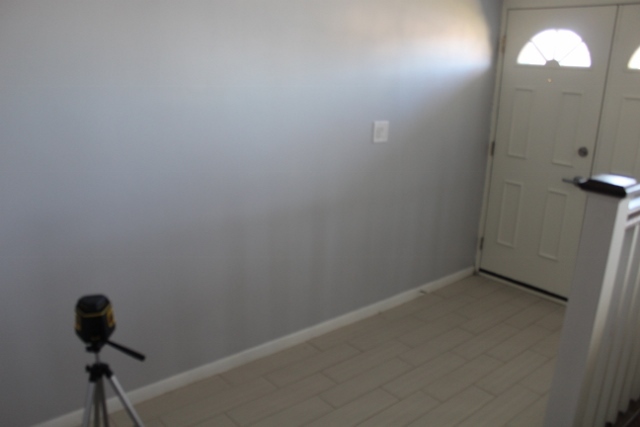 Plus, the baseboards were already painted in gloss, so we thought it should all match. I’ll let you know if two months in, we re-paint everything in satin. 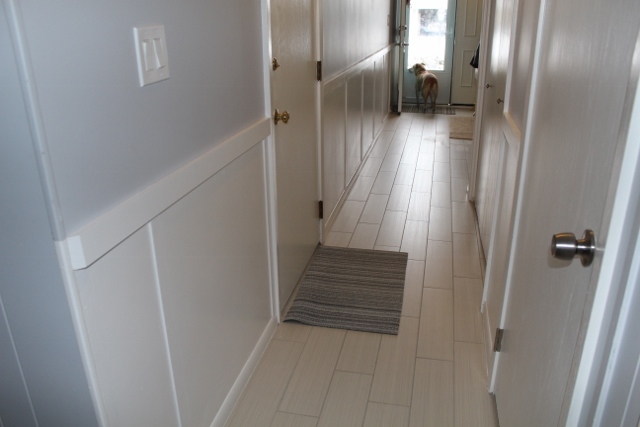 We used the existing baseboards as the bottom part of our board and batten, so all we had to buy was lattice for the downward strips and top rail for, you guessed it, the top rail. Forty-two feet of lattice (seven six foot boards) and three pieces of top rail did the trick (and we had leftovers of each). Once the paint dried, it came time to attach the boards to the wall. We used both Liquid Nails and a nail gun on each piece of wood. We played around with spacing, and since we wanted our board and batten to look more square-like than rectangular, we space our lattice pieces every thirty-one inches. It then came time to paint again. This was the second coat on the walls, but the first on the boards. We let everything dry, then applied one last coat. After removing the painter’s tape, we took stock of any little cracks and crevices that needed caulk. Dan got out his caulk gun and filled in all the small spaces. Finally, he got out a bit more paint and did all final touch ups. We learned a few things along the way. For starters, we wouldn’t have put the painter’s tape up first. One area of the tape bowed up a bit, so some of the white paint got above the top rail. Instead, we would attach the top rail first, then put painter’s tape above it. We also think we would caulk between the second and third coats of paint. While it looks fine, it might have been a little easier to give the whole area a fresh coat of paint, rather than go back and do small touch ups. You live, you learn. We’ll be sure to make the proper adjustments when we board and batten the upstairs. The space still isn’t done. 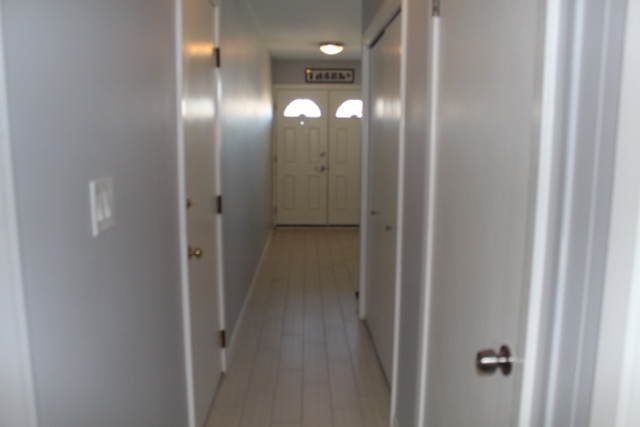 I’d love to get some art up on the long hallway, and perhaps I can find a long colorful runner too. But, for about $75, this is a fairly easy upgrade that is well worth the time and money.